India, world's largest democracy, has witnessed enormous development in information technology over past few years. It has become a necessity to share personal information for every service, from getting a mobile phone connection to registering for online banking. India being a collectivist society (one of the developing countries part of BRIC), has different expectations of privacy than other developed nations. The concept of privacy in India has not been investigated in detail, and we also lack empirical data with respect to privacy perceptions among Indian citizens. Recent developments in the Indian scenario e.g. privacy bill, UID project signify a need for privacy awareness and understanding in Indian masses. It is also important for policy makers to comprehend sentiments and opinion of masses for structuring effective laws and policies for the citizens of India. 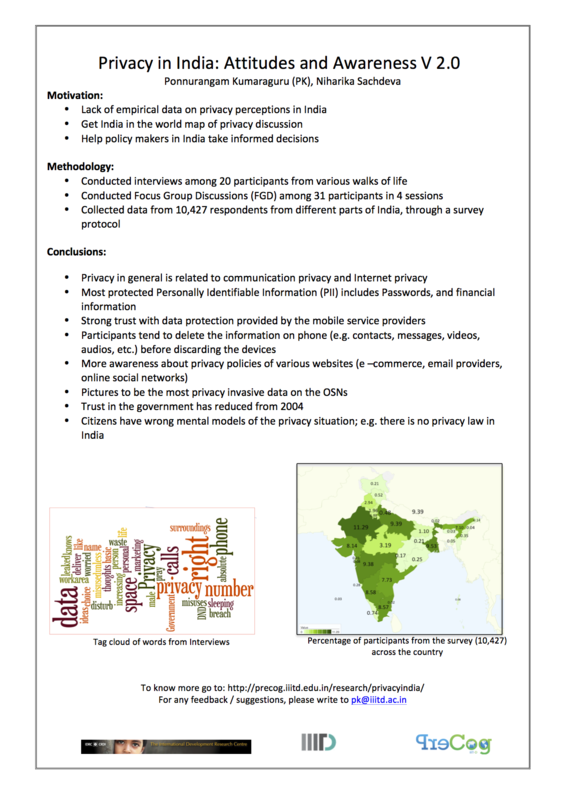 Our study focuses on understanding privacy perceptions and expectations of Indian citizens. In the first phase, we conducted interviews among 20 participants and 4 focus group discussions with 31 participants, to collect qualitative data about the privacy perceptions. In the second phase, we developed a survey questionnaire to collect quantitative data. We collected responses (10,427) from various cities in India. We hope the understanding developed through the responses collected during the study, helps decision makers and technology developers in producing customizable solutions and laws for Indian users. Also, it will help us in identifying conflicting nature of users in their expectations and practices on privacy matters. As far as our knowledge goes, this is the largest ever study on privacy perceptions in India, we also believe that, this is the case around the world too. To know more about what people in India think about privacy explore our data here (limited responses shared for now. More coming soon) . Who is talking about this research? Jan 8, 2013: Doordarshan interviews Dr Ponnurangam Kumaraguru about our study, "Good evening India: Dr. Ponnurangam Kumaraguru (PK) from IIIT-Delhi on Privacy in India"
Dec 10, 2012: Times of India writes about the study, "Most Indians ignorant about privacy issues on Facebook, Twitter: Study"
Dec 10, 2012: Siliconindia NEWS writes about the study, " Most Indians Ignorant About Privacy Issues On Internet, Social media: Study"
Dec 10, 2012: TodayHeads writes about the study, "Most Indians ignorant about privacy issues, reveals study"
Dec 10, 2012: The Shillong Times covers the study, "Most Indians ignorant about privacy issues, reveals study"
Dec 10, 2012: The Gulf Today covers the study, "Most Indians ignorant about privacy issues, reveals study"
Dec 10, 2012: IBN live article about the study, "Most Indians ignorant about privacy issues related to Internet: Study"
Dec 9, 2012: Zee NEWS article about the study, "Most Indians ignorant about privacy issues: Study"
Dec 9, 2012: Jagran covers the privacy study, "Most Indians ignorant about privacy issues: Study"
Dec 9, 2012: Deccan Chronicles publishes our work, "Most Indians ignorant about privacy issues: Study"
Dec 9, 2012: Business Standard covers our study, "Most Indians ignorant about privacy issues: Study"
Dec 9, 2012: Economic Times article about the study, "Most Indians ignorant about privacy issues on Internet, social media: Study"
Dec 9, 2012: Deccan Herald covers our study, "Most Indians ignorant about privacy issues: Study"
Dec 9, 2012: Asianet covers our study, "Most Indians ignorant about privacy issues: Study"
Dec 9, 2012: Firstpost covers our study, "Most Indians ignorant about online privacy issues: Study"
Dec 9, 2012: msn News, "Most Indians ignorant about privacy issues: Study"
Dec 6, 2012: The Privacy Advisor from IAPP covers our study, "Professors Publish Largest To-Date Study on Privacy in India"
Nov 27, 2012: Shivangi Nadkarni, Wake Up, Marketers in India! For any feedback / suggestions, please write to pk[at]iiitd[dot]ac[dot]in.